Every stage of a company’s growth holds unique challenges. In my opinion, the startup phase until to about $2M in revenue for a software company as well as startup to $10M for a hardware company is the hardest stretch of all. But growing a business is almost always hard and there are several natural revenue levels where companies tend to “get stuck”. Similar to the hardware/software contrast above, revenue levels for different business models can be quite different as well. So it’s hard to generalize strictly upon gross revenue levels. But undoubtedly there are stages that every company goes through (startup to profitability, profitability to stable small company, stable small company to mid-sized company, etc.) which represent points of inflection in terms of the way a company operates. For a simple example, you need quite a bit more formal process to operate a large company than a very small one. Also the methods of capitalizing a large company are very different from a bootstrapped or VC-backed startup. There are many more possible examples; I’m sure you get the picture. For this article we’ll focus on growth into the Mid-Market stage. As a startup or smaller technology company, you’re often restricted by resource realities with respect to who you can hire. Startups are often forced to hire people with less direct experience than they’d like and pay them less than the going rate in cash compensation. You often can’t fill every hole, even all the ones that you think are critical. People have to wear two or more hats and the type of people you can attract might be those that really prefer the small company environment, or are dreaming big dreams based upon the potential of stock options. In short, hiring is continuous compromise between being able to attract who you’d like-vs. what you really need. As you grow into the mid-market size you have more resources to pay market rates and are generally more attractive to a larger pool of employee prospects. But please, be careful–just because you can hire differently doesn’t mean you should. I’ve seen folks get drunk on hiring during this growth phase and get loaded down with overhead that makes running the business to optimal profitability quite a bit harder. As you grow there is also a tendency to go after people with big, blue chip company resumes, which sounds great on paper but can be very dangerous. If these candidates don’t also have experience in smaller companies, you’re setting yourself up for a very premature and inappropriate culture change. 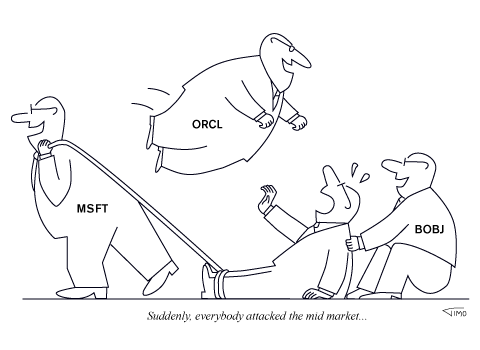 It’s important to guard against building a big company bureaucracy too quickly in a middle market sized company. Much like in hiring, there is often a tendency to want to add too much process, too soon. In fact, I believe this is the absolute biggest danger executive management needs to guard against during this transition. The CEO and senior team are usually very aware that the business is outgrowing its current level of checks, balances and controls. Inevitably there is a need for additional and more formal processes. The typical mistake I see is that instead of adding process carefully, gradually and ONLY as really needed, folks want to radically change the business overnight. The result is often a still-modest-sized business operating like one with 50,000 employees: Meaning operating VERY SLOWLY. Guard against this! Mid Market companies still need to rely on speed and agility to compete with the corporate giants who have many more competitive advantages that you can’t yet replicate. Around the mid market stage, a single-product or single market-segment company may be running out of room to grow at the rates it has historically enjoyed. This is a day of reckoning and a danger point that stops many promising companies in their tracks. If you need to expand into new products or markets, make sure that you do so rationally. Don’t go out and acquire a company in a completely different business because your investment banker thinks it’s undervalued and a great buy. Do “diversify” into “adjacent” markets, taking one of your existing technologies into a different market or introducing a new technology or product category to your existing market segment. This is the stage where you absolutely need to hire a serious CFO with financial market savvy and connections. Many startups have someone with a CFO title whose background is really accounting and basic financial controls, or possibly and outsourced, part-time CFO. This usually is fine up to this stage. But once you are talking about opening new offices, funding a new market focus or whole new line of product technology, the capitalization game has changed. The skill set of controlling the company’s simple expenses and dealing with a small number of angel and VC investors now becomes inadequate. The company needs someone that understands raising money in institutional financial markets, along with the contacts that go with that knowledge. Budgeting and controls will also start to become more decentralized and/or complicated, requiring a different financial management style as the company continues to grow into the upper end of the mid market phase. As your business grows into new markets and product categories, your distribution system must often change and grow with it. This might be the time that you begin to open offices in all the key geographic markets of the world. But don’t do this “just because it’s time”. It should be done only for good business reasons, such as increasing marketing in countries where a distributor won’t or can’t do what’s necessary to accelerate local growth. It might also be the time that a single distribution channel business needs to become multi-channel. For example, a direct-only company adds retail or VAR channels. Again, avoid the temptation to do these types of things because your business has grown to a certain stage. It adds complexity and overhead to your business, so make sure there are sound business reasons for the change. Moving to a different customer set or new base technology can have a profound effect on the product planning and development process. It is often at this stage that you must stop relying on a single set of market veterans or insiders, who have been successful in bringing out products due to deep, long-term domain knowledge in your original market/product focus. Now is often the time where there needs to be a bit more standardized and professional product planning and development process, as you broaden both the number and scope of development projects. The bottom line is that as you grow out of the technology company startup phase the way your business operates will necessarily need to adjust, to continue strong growth. But do nothing “before its time”. The biggest danger here, in my opinion, is trying to “get big” before your time. While the big blue chip companies are often envied, trying to duplicate their current mode of operation while you’re just entering the mid-market stage is probably the best way to ensure that your company will never reach that blue chip status. “Get big” in the way you operate cautiously–because once you’ve bureaucratized your business, it’s very difficult going back. That’s my take on going from a startup to mid-market. Share your own growth stories with us–good or bad–to expand the discussion.